What is the most important for the gold market, the US economic growth is expected to decline to 2.5 percent in 2019 (unchanged forecast from October) because of the unwinding of fiscal stimulus and further monetary tightening. The slowdown in America may push some investors into gold’s arms, although, given the sluggish growth in Europe, US dollar-denominated assets still look attractive. The downward revisions may seem to be modest. However, the report does not end here. The problem is that risks to more significant downward corrections are rising. What are these risks? First, a further escalation of trade tensions. Higher trade uncertainty could further dampen investment and disrupt global supply chains. Second, a further deterioration of financial conditions: stock valuations went south, while credit spreads widened. Given a high level of debt, a more serious tightening of financial conditions may be particularly dangerous. 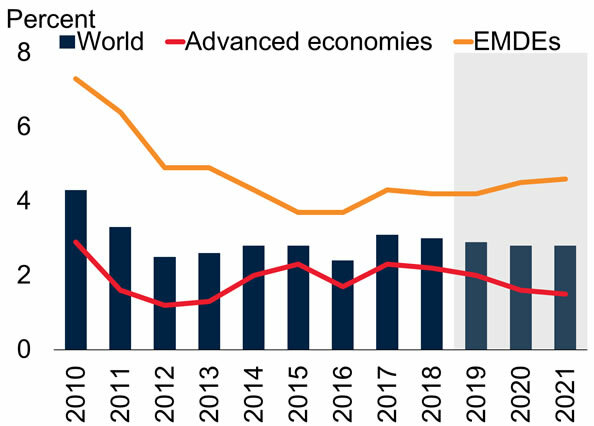 Last but not least, an important risk for the global economy is the possibility that China’s growth slowdown could be faster than expected especially if trade tensions continue. And, of course, Brexit is a big question mark (the US federal government shutdown, if protracted, also poses a downside risk). Gold is a safe haven, so it welcomes rising risks.